This Tales Tweet of the Week may be the tweet of the decade. From no less than the Senate minority leader, Senator Mitch McConnell R-KY. He did have a little competition from the Hugh Hewitt chat room's Suzanne from New York- but since she doesn't have a twitter handle she does not meet the strict standards the Tales sets forth when searching for it's tweet of the week. Those strict standards-to be a tweet of the week, it must be a tweet. :-) Suzanne chatted in the Hughniverse: "Nanny Bloomberg got his big gulp ban stroke down. Gives new meaning to term 'soda jerk'." 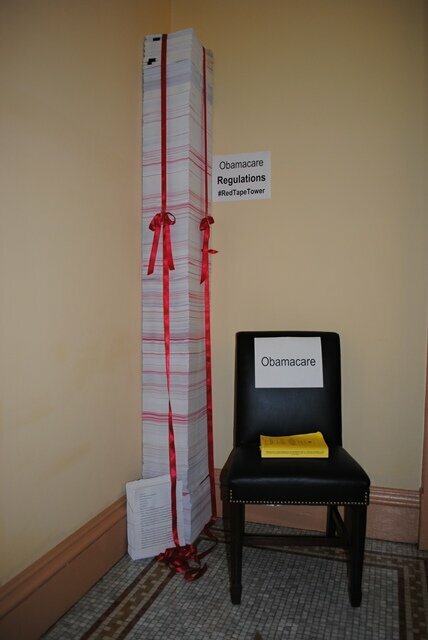 What you see depicted in the great picture by Senator McConnell is the original Obamacare bill on the chair and all of the regulations in that red tape tower...as of now. 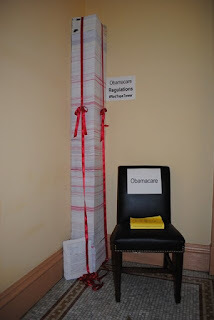 Obamacare hasn't even been fully implemented yet and you can see a mind boggling amount of regulations already. It will grow to an even more frightening amount the closer we get to full implementation. Let us pray there is some intervention that halts implementation. Note: If you were to take the Obamacare bill off the chair all you would have left would be the presi...oops, better not go there. It blows my mind. It's beyond looking at total destruction of the most wonderful healthcare in the world. Thanks a lot Americans that voted for this guy and those conservatives that didn't vote out of principle....this is what you get. Unfortunately, this is what we all get because of their votes or lack thereof.